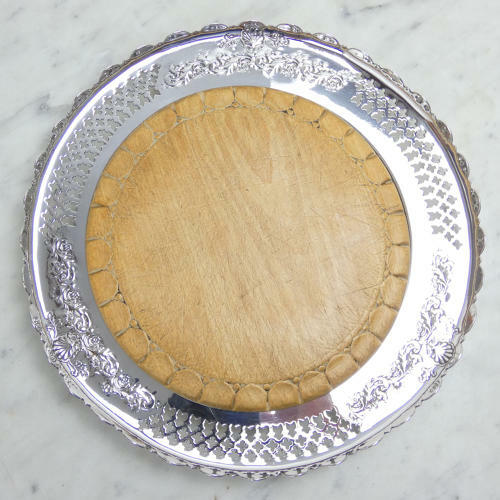 A carved wooden breadboard with a silver plated surround. The plated surround is marked, to the base, 'W & H' within a flag, above '51002 A1 WALKER & HALL SHEFFIELD ENGLAND' and it dates from c.1900. It is typically Victorian in style. The surround has elaborate pierced and chased designs with a turned up, scalloped rim. The wooden board has a simple carved border and it sits neatly into the surround. Both parts are in excellent condition.